Speed3 Rotors on 2007 non-Speed3 hatchback? Apparently I drive aggressively (heh) and I have a tendency to warp my Mazda3 2007 hatch front rotors easily. I was thinking of stepping the front brake set up a notch by running steel braided lines and upgrading to the Mazda Speed 3 rotors for a tad more braking power. The stock Speed3 rims are 18", and I'm running some Motegi aftermarket 17" rims on my 07' hatch. It "looks" like there's going to be enough clearance to upgrade to the stock Speed3 rotors/calipers, but I was wondering if there was anyone else out there who did this upgrade? ..and are you running 16", 17", or 18" rims?? Thanks for sharing! Very interesting. I'll bed in the new set (due for replacing anyway) and see if it makes a difference. I have also found that going for a quick fang running some highly metalized sintered, street legal. track day type pads also deglazes the disks and gets rid of the "warping". I keep a set of these pads specifically for this use but run normal pads the rest of the time. These pads are extremely abrasive and if used all the time would soon take the rotor down to its minimum thickness. You would not want to run them all the time. Note this is not on a Mazda 3 but on larger Oz made Ford Falcons and Fairlanes and on a Mitsubishi LC Lancer (same as the Plymouth Arrow in the US). Last edited by aussiblue; June-18th-2017 at 08:55 PM. A quick "fang"? What on earth does that mean? Like, a "zip around the block" or something? Just enough to bite them in? Fang - Drive a car a high speed (now obsolete). I suspect it's an abbreviation of Fangio (the F1 driver of the 1950's ) but in any event go for a spirited race car like drive involving some heavy braking. A high-speed drive in a car. 1960s: from the name of J. M. Fangio (see Fangio, Juan Manuel). (In car culture) to instantly drive with as much haste as possible considering the situation. To take the vehicle right up to its limits of grip in all dimensions. "Oh **** the cops are coming, lets fang it!" "Watch me fang it through here"
"Wow that guy is fangin it"
I gravitated to my favourite set of roads. Last edited by aussiblue; July-11th-2017 at 10:48 PM. Ah, you are from down under, that explains my not knowing it. (Although I'm Brit born, but it must never have made it to the UK either, hah). But the poms use it already (albeit perhaps only the ones of my ancient generation) e.g. Jaguar XE feature review: a 1351-mile drive to Gibraltar by CAR Magazine Daily grind as well as the occasional country fang. 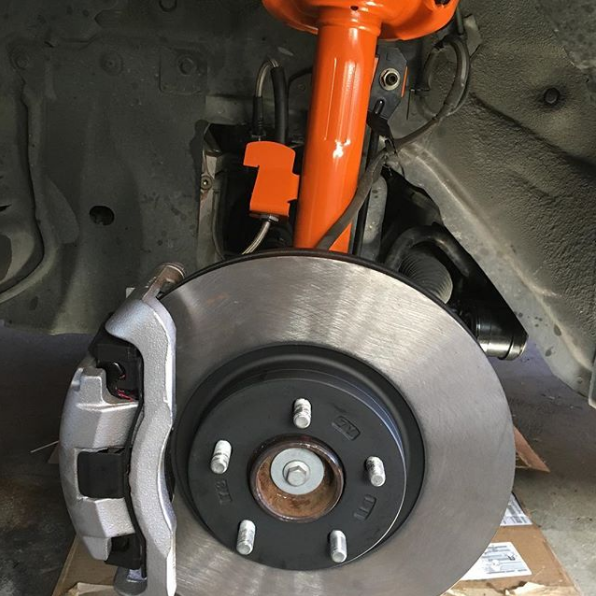 Mazdaspeed3 brake parts won't fit your 3 unless you swap out the whole shibang: Calipers, rotors, brackets, lines, master cylinder. The rears are interchangable/the same. A lot of people, when doing the MS3 brake swap, put Mazda5 rears on. The swap right in and are a little bigger. Last edited by eggynatey; July-12th-2017 at 10:42 AM. I did the MazdaSpeed Mod. They are 12.6 inch rotors. Got the rotors from a online dealer, the calipers from a junk yard, braided brake lines, new lower control arms and Koni shocks. Quick Reply: Speed3 Rotors on 2007 non-Speed3 hatchback?